Iemoto Participate “SpecialIkebanaExhibition” at Edo Tokyo Museum in Ryogoku. New Year Seminar at Ichiyo Headquarters. Ichiyo New year Party at Keio Plaza Hotel in Tokyo. Ichiyo Headquarters / Chapters Joint-Seminar at Ichiyo Headquarters. Ikebana Trying class by parent children, sponsored by Culture Ministry at Aomori. Ichiyo Aomori Chapter Seminar by lemoto. The 49th Ikebana Kyokai Exhibition at Matsuzakaya Dept. Store in Ueno,Tokyo. 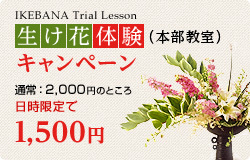 Ikebana Trial class by parent children, sponsored by Culture Ministry at Miyakojima, Okinawa. Ikebana Trying class by parent children, sponsored by Culture Ministry at Taramajima, Okinawa. Naohiro Kasuya and Yamamoto Ceramic Artist, Joint Exhibition at Tsuta Salon Gallery in Omotesanndo Tokyo. Nihon Ikebana Geijutsu Kyokai Exhibition at Sendai. “IKEBANA LIVE” by Iemoto “Ichiyo Hana Festa 2010”at inTokyo. Ichiyo Headquters / Chapters Joint-Seminar at Ichiyo Headquarters. Summer Seminar at Sophia University by Iemoto. Ichiyo Joint-Seminar at Ichiyo Headquarters. Saika Ikebana Exhibition at TobuDept. Storein Ikebukuro, Tokyo. the Museum of Design Atlanta, USA. Nihon Ikebana Geijutsu Kyokai Exhibition at Kanazawa. Iemoto Demonstration / Workshop for the 11th I.I. Manila, Asia Reg. Conf. Country Club in Philadelphia U.S.A.
NaohiroKasuya’s Ikebana Demonstration / workshopfor I.I. Memphis. The 84th “Ikebana Contest in 2010 at Tokyo. Iemoto Participates in the I.I. Tokyo Founding Chapter Fair at Tokyo. Ichiyo Winter Seminar at Ichiyo Headquarters.